GIA LAI — Artisans in the Tây Nguyên (Central Highlands) are asking for financial support from local authorities to preserve ethnic Jarai epics, oral folk literature that is now known by the elderly only. The oral epics, called Khan, have been handed down from one generation to the next. They contain verses and songs within thousands of words that are easy to learn by heart. Khan features the myths, legends and stories of brave and compassionate local people. In the past, Jarai people sang Khan every day after hard work in the fields. Singing helped them become stronger and happier in their lives and work. Today, very few young people know or sing Khan. “Old villagers who collected and taught the epics have passed away. A decade ago, our village had only three artisans familiar with Khan. After their death, no one has taught the art to youngsters,” said Puih Binh, head of Jút Village in Ia Grai District. Khan contains stories about the lives of Jarai people, describing the spirit of their society, natural calamities and social relations, told in a boasting, heroic and impressive style. "We hope local authorities, cultural researchers and old villagers work together to preserve Khan because ethnic minorities, Jarai people in particular, can’t survive without their traditional culture," he said. “I wanted to share my love of Jarai culture with young people,” added the 60-year-old. In recent years, Ksor has had difficulties delivering his art to youth. Modern life is coming to our villages day by day. Youth have more choices for entertainment and fewer chances to learn singing Khan. Meanwhile, there are few ethnic artisans able to introduce the epics. 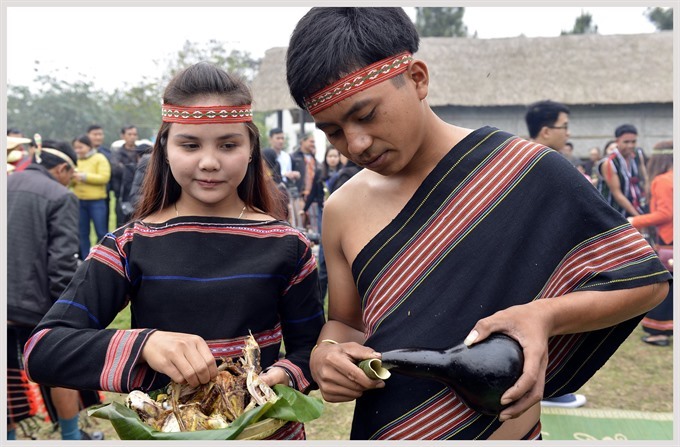 Phan Xuân Vũ, director of the province’s Department of Culture, Sports and Tourism, said the province has only 50 artisans, mostly elderly, who can offer Khan teaching. “Khan has played a role in Tây Nguyên’s folk culture. It should be preserved by not only the elderly but also by younger generations,” he said. Vũ believes that the most effective method for preserving Khan epics is to expand teaching at schools. “In addition, the oral tradition of reciting the works should also be encouraged more frequently during local activities and festivals,” he said.